As progress moves towards 93%, the new stadium in Parramatta is on its way to host the first 20 large events in 2019. Yes, the schedule is very busy already, so no delays can occur if it's to be retained. In the passing week progress at Benkwest Stadium reached 92% and is moving forward rapidly, all in the effort to hand it over by the end of March. At that point only 3 weeks will be left for use permit and testing before opening game, scheduled for April 22. At this point the membrane roof is fully delivered, while over 80% of the 30,000-seat auditorium is installed. Field installation is also moving forward as the rugby fixture between Parramatta Eels and Wests Tigers. Structurally, as one would expect, all of the 26,000 m3 of concrete and 4,500 tons of steel are in place but a lot of furnishing and installation works still have to take place. They have to because the calendar already includes 20 different games in 2019, almost every weekend until October and with first long break between events in September. 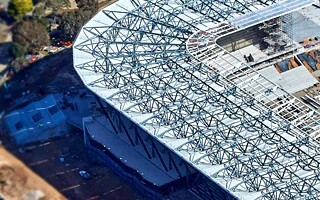 Vast majority of the planned games are rugby league and rugby union but football is also planned as Western Sydney Wanderers are also listed as tenants at the stadium.